All adults — including people with various disabilities — should aim for at least 150 minutes of moderate aerobic activity, or 75 minutes of vigorous activity, or an equivalent mix of the two throughout the week. Twenty minutes of moderate activity is roughly equal to 10 minutes of vigorous activity. During moderate activities, you can talk, but not sing; during vigorous activities, you can manage only a few words aloud without pausing to breathe. Adding time — up to 300 minutes of moderate activity, or 150 minutes of vigorous activity, or a mix — increases the health benefits gained. Twice-weekly strengthening activities for all major muscle groups (legs, hips, back, abdomen, chest, shoulders, and arms) are recommended, too. 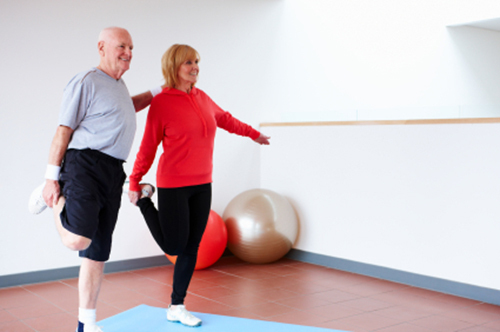 Balance exercises are particularly important for older adults at risk of falling. Flexibility exercises may be helpful, too. This much activity is a pretty high goal, and can feel overwhelming. If you can't meet all of the guidelines, experts suggest doing as much as you can. Some activity is always better than none. Even short bits of activity, such as five minutes of walking several times a day, are a good first step toward meeting a bigger goal. For more information on improving your balance and preventing falls read Better Balance, a Special Health Report from Harvard Medical School.